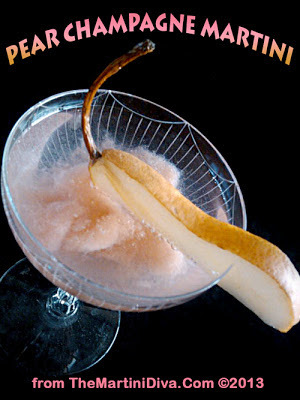 Spoon the sorbet into a martini glass or a coupe, pour the bubbly over the sorbet, slide your pear onto the rim and enjoy! Since I had the Brut that is what I used and, frankly, I liked the dryness with the sweet sorbet but feel free to bubble this up with your choice of sparkling wine - you could even use soda for a mocktail version! I served this up with some Pear & Blue Cheese Bruschetta and you'll find that recipe over at my Diva of Tiny Foods Blog today!